CARFAX 1-Owner. Premium Collection trim. EPA 24 MPG Hwy/17 MPG City! Heated/Cooled Leather Seats, DVD, Sunroof, NAV, Rear Air, Panoramic Roof, Heated Rear Seat, AUDIO SYSTEM, AM/FM STEREO, SINGLE DI... TRANSMISSION, 6-SPEED AUTOMATIC, FWD... ENGINE, 3.6L SIDI DOHC V6 VVT. SEE MORE! Leather Seats, Navigation, Sunroof, Panoramic Roof, Rear Air, Heated Driver Seat, Heated Rear Seat, Cooled Driver Seat, Back-Up Camera, Premium Sound System, Satellite Radio, Onboard Communications System, Remote Engine Start, Dual Zone A/C, Cross-Traffic Alert MP3 Player, Keyless Entry, Child Safety Locks, Steering Wheel Controls, Electronic Stability Control. ENTERTAINMENT SYSTEM, REAR SEAT DUAL-PLAYER DVD with Blu-Ray video and music compatibility, wireless headphones and remote control, WHEELS, 20 X 8 (50.8 CM X 20.3 CM) CHROME, BRIGHT FINISH, ENGINE, 3.6L SIDI DOHC V6 VVT (308 hp [229.7 kW] @ 6800 rpm, 265 lb-ft of torque [357.8 N-m] @ 2400 rpm) (STD), TRANSMISSION, 6-SPEED AUTOMATIC, FWD, 6T70 with tap-up/tap-down (on shifter), performance shifting and manual-up/manual-down (STD), AUDIO SYSTEM, AM/FM STEREO, SINGLE DISC CD PLAYER dual USB ports, SD card slot and auxiliary jack (STD). 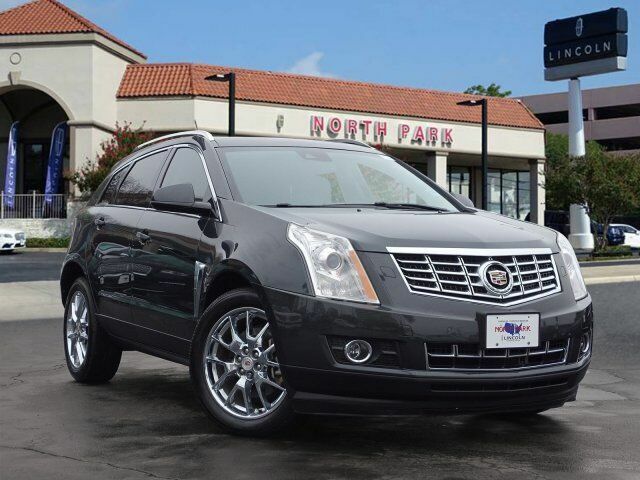 Cadillac Premium Collection with Graphite Metallic exterior and Light Titanium w/Ebony accents interior features a V6 Cylinder Engine with 308 HP at 6800 RPM*.
. being behind the wheel of an SRX definitely imparts an authentic luxury experience and it strikes an enjoyable balance between ride comfort and handling. It`s also one of the few entry-level luxury crossovers that still has a standard V6 engine. -Edmunds.com. Great Gas Mileage: 24 MPG Hwy.